This impressive building alows you to stand out from the crowd with flexible office space and meeting rooms on the 12th floor. Located in the Xiangzhou district, in the Zhuhai Jida Central Business District and is less than 15 minutes from the Zhuhai Railway Station. Office space prices from ¥2190 per month. 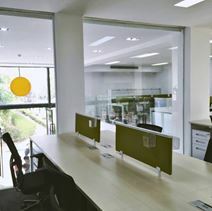 This high-end co-working space is located on the Southern software park, a Zhuhai landmark. Easy access is provided with more than 10 bus lines servicing the area. Inspired by the Google offices the centre was founded in 2016 and as well as common spaces there are also private offices available for between one and 100 people.